Where is Cynthia Frelund This NFL Season? Cynthia Frelund became somewhat of a daily fantasy sports celebrity last year. Shortly after being hired by ESPN as a DFS analyst, Frelund became associated with a claim that she finished over 90% in the money at top DFS sites. The claim was obviously inflated, but it did achieve one goal — get DFS players talking about Frelund and wherever she was giving commentary. The fact Frelund is an attractive woman doesn’t hurt either. It’s hardly a secret that the world of daily fantasy sports is a sausage fest so the sight of anybody without a nacho-stained TV shirt is a welcome sight. But with a win rate that undoubtedly briefly made Condia question his career direction, it left many DFS fans wondering why she was wasting her time doing commentary? After an apparent successful stint on ESPN last year, where is Cynthia Frelund giving her analysis during 2016? We attempt to answer this question as well as some other things you wanted to know about Frelund but were afraid to ask. What gender is Cynthia Frelund? Female. She is female. Isn’t that why you are reading this post? How old is Cynthia Frelund? It is not precisely known how old Frelund is, but she was born on August 24th. She began college in 2001, so if you want to say she was born around 1983 and about 33 years old we wouldn’t stop you. What is her educational background? According to her Linkedin page, Frelund attended Boston College where she obtained a degree in Biology. She mastered her analytic chops at Northwestern University with a Master of Science in Predictive Analytics. How tall is Cynthia Frelund? That’s a weird question, but since you asked, we’ll tell you what we could find. Cynthia Frelund’s height is apparently not public, either. 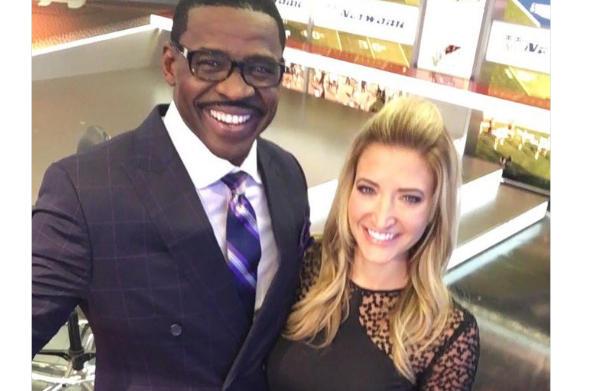 Here is a recent picture of Frelund next to Michael Irvin, who is 6′ 2″. Subtracting for likely heels and hair we would estimate Frelund to be around 5′ 3″ (plus or minus five inches). What were her original win rate claims? In her ESPN bio, Frelund boasted an “in the money rate” of 94% on DraftKings and 90% on FanDuel. The claims were featured in some ESPN appearances shortly after she first went on the air. @Troll4MVP @DFSTakeOVER @dan_back I play where I can win and I don't go high stakes! The analytics are what I love! Why were the win rate claims ridiculed? The fact is that top daily fantasy sports experts have difficulty achieving a 70% ITM rate, makes the 90% “In the Money” claims almost impossible. Add this to the fact that Frelund was not well known in the community before she was hired by ESPN led many daily fantasy sports players to be very skeptical. Also, some people like to put each other down. It’s the internet, after all. For what it’s worth, former employer ESPN backed off the win rate claims and they have not been repeated recently since. What is Cynthia Frelund’s DraftKings account name? There is no record of her actual recorded performance that we could find. Cynthia Frelund’s DraftKings account name is Cynthia94. Cynthia Frelund’s FanDuel account name could not be found. She does seem to know her stuff and seems increasingly proficient in front of the camera. Whether Frelund is or isn’t creating her own content or thoughts is almost besides the point. She provides solid analysis and information for recreational players to think about when setting up their lineups. Plus, anything to get more diversity into daily fantasy sports can’t be a bad thing. What is she up to this year? Frelund is appearing on variety of NFL Network shows including NFL Fantasy Live, NFL GameDay Morning as well as coverage of the Super Bowl, the Combine and NFL Draft. She is also writing a weekly column for NFL.com where she shares her top 15 must-read stats for the week. Cynthia Frelund projections and rankings are not posted. Where else can I follow Cynthia’s commentary? Cynthia has a fairly active Twitter feed, which she updates with musings, picks and other daily fantasy sports information.